"I got stripes, stripes around my shoulders." Not much different than the prison-bound Cash once sang about, fashion enthusiasts will be donning wide stripes this season. Although the contrasting black and white reigned supreme at the spring/summer 2013 shows, designers used a variety of color combinations such as red/white, green/white, yellow/white, and blue/white. Whether vertical, horizontal, or curved stripes, there is no doubt that the eye-catching print flatters the body. 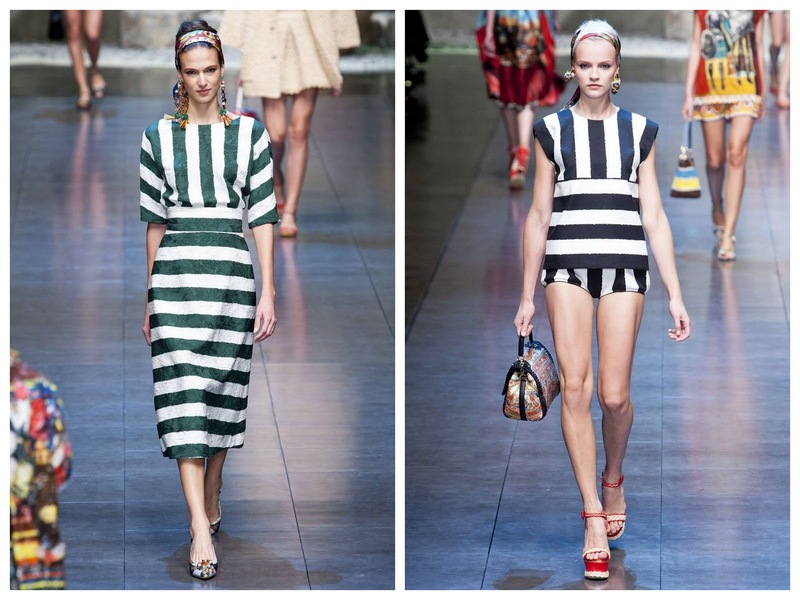 Not only are stripes being seen on clothing, but accessories as well, including shoes, sunglasses, and handbags. The details that make the common graphic unique this time around are the width and placement of the stripes, making them sixties-inspired mod. The transformation of the often mediocre pattern is definitely a visual treat. Marc Jacobs, Dolce & Gabbana, Moschino, and Christian Dior are among the many fashion houses to embrace the made-over and beloved stripe. After zero success searching local fabric shops and online stores, I finally found a wide-striped black and white fabric at an Ikea just outside of Denver. Although a heavier fabric meant for home decorating projects, I went ahead and bought a yard and a half to make a summer shorts romper similar in shape to the one I made last summer. After creating a new pattern out of muslin (six pieces for the torso, a waistband, and four pieces for the bottom), I cut, carefully lined up the stripes, and began sewing. The romper turned out exactly as I imagined and will be perfect for the upcoming warm summer months.